On the 26th of September, the Alumni Committee welcomed Mr. Vernon Fernandes, an alumnus of the 2014 batch, for a Coffee with Alumni session to address a few students of the junior batch. Mr. Fernandes is an Assistant Manager in the Corporate and Investment Banking Team at Citicorp Services India Ltd. He has experience in the Equity Research markets, Portfolio Management, and Investment Banking sectors and has also been associated with the Abu Dhabi Commercial Bank, NVS Brokerage Pvt. Ltd. and CRISIL. The session started with the students introducing themselves and sharing their memorable moments at SIMSREE. Mr. Fernandes then introduced himself as an avid investor and spoke about the prestigious Dewang Mehta National Award that he had won during his college days. He gave a thorough description of the opportunities in the financial sector which include Retail Banking, Commercial Banking, Investment Banking, Corporate Banking, etc. 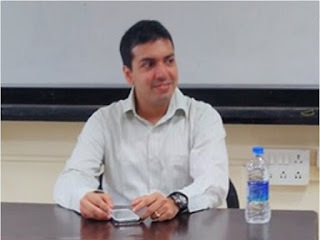 Mr. Fernandes then shared a detailed account of a career in different segments like Insurance, where one could opt for Sales or Actuarial Sciences; Asset Management, where people are spoilt for choices between Equity Research and Mutual Fund; Alternative Asset Management, where portfolios like Real Estate Investment or Private Equity are the best choices. The students were also briefed about the types of trading. While sharing the experience of his transition from back end to front end office in investment banking, he stated that the passion to work is of paramount significance in a profile like investment banking which involves strenuous working hours. Students were also given tips to crack their interviews by engaging in crisp replies as expected by any interviewer. A simple lesson of ‘Make an offer that the interviewer cannot refuse’ was what Mr. Fernandes insisted upon, as an interviewee is always judged relatively with the other competitors. The students were encouraged to participate in various competitions which would eventually help them in developing their personality to pave their way to the top. Students were advised to avoid looking at the materialistic aspects of the job during selection as job satisfaction and happiness matters in the long run. Inspiring the students with real life examples, he encouraged them to never feel dejected or give up as hard work is the key to success. We thank Mr. Vernon Fernandes for taking time out of his busy schedule to visit the campus and sharing his valuable insights.